Having first opened its doors to traders in the late 1800s, Hubbell Trading Post on the Navajo Reservation in Arizona is one of the oldest operating trading posts in the American Southwest, where the differing cultures of the Indians, Spanish, and Anglo-Americans have come together for mutual benefit. For almost 90 years, the Hubbell family welcomed traders and notable visitors to trade with the Navajo. The Spanish roots and character of this family not only influenced the lives of the Navajo, but also of the visitors that they encountered. Although the Hubbell family eventually sold the post in the 1960s to the National Park System, the Western Parks Association has continued to operate it as a trading business as if it were still under the management of John Lorenzo Hubbell and his family. Today, visitors can learn about the Navajo’s heritage and their material culture, witness traders negotiating deals with American Indians, learn to weave Navajo rugs, and purchase crafts and art from the Indians at any of the trading post’s shops. 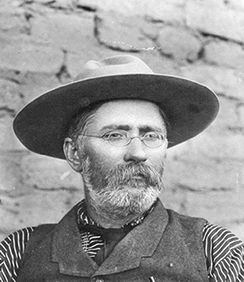 Although John Lorenzo Hubbell established the post in 1878, the story of Hubbell Trading Post begins in the early 1860s, when General James H. Carleton began forcibly removing the Navajo Indians from their homelands in an effort to find gold in the Navajo territory. Leading this gruesome campaign was Colonel Christopher “Kit” Carson who, under the direction of Carleton, instituted a “scorched earth” policy in the Navajo territory. Under this policy, Carson’s troops were to destroy the Navajo’s livelihood by killing their livestock and by burning their homes and crops. To terrorize the Indians into leaving their homelands further, Carson and his men massacred Navajo men, women, and children. By the winter of 1863, after suffering from starvation and fearing the loss of more people, the Navajo surrendered to Colonel Carson’s troops. The following year, Carson and his troops rounded up the Navajos who survived General Carleton’s vicious campaign, and forced over 8,000 Navajo to walk more than 300 miles from northeast Arizona to Fort Sumner in eastern New Mexico. Known by the Navajo as the Long Walk to the Bosque Redondo, a 40 square mile reservation on the Pecos River, this episode changed the Navajo world and had a significant influence on their material culture and economic pursuits. While living at the Bosque Redondo reservation, the Navajo attended school, practiced Christianity, and learned to incorporate in their daily lives the products that the mobile trader introduced into their society. They grew highly dependent on these new materials, which the people used to make the crafts that the Navajo exchanged with traders for food and other products that were essential for their way of life. Without the mobile trader, the people would not have survived in the world the white man created, especially after the government allowed the Navajo to return to their homelands in 1868. Following the return of the Navajo from the Bosque Redondo, traders continued supplying them with the materials they had grown accustomed to using during their four-year exile. Among the traders to establish a successful relationship with the Navajo was John Lorenzo Hubbell. Hubbell not only developed an industry from the Navajo crafts, but also helped the Navajo adapt to their new environment and readjust to reservation life. He had become familiar with the Navajo’s language and traditions while traveling around the Southwest as a Spanish interpreter for the U.S. military. Hubbell was able to use his knowledge of the Navajo culture and language to establish perhaps the most successful trading empire in the American Southwest. He opened the trading post that is now Hubbell Trading Post National Historic Site in 1878, ten years after Navajo returned to their homeland from their Bosque Redondo exile. Hubbell’s trading empire at one point consisted of 30 trading posts, two wholesale stores, a few curio shops, and some bean and apple farms in Gallup and Farmington, New Mexico. His facilities allowed the Navajo to display their art and crafts, while also providing the Indians with food and the material goods they required to make their crafts. This was also a place where artists and other travelers, including Theodore Roosevelt, could find shelter. Eventually, as his business developed, Hubbell was also able to build freight and mail lines, which he used to transport supplies and to send mail order catalogs that promoted Navajo crafts. Hubbell’s career as a trader served as a link between the Navajo and Anglo cultures. Known to the Navajo as “Old Mexican,” Hubbell had both Spanish and American ties - his father was a Connecticut Yankee and his mother a Gutierrez Mexican. Hubbell’s empire and his attitudes about the role of land and the way family organization and lifestyle were connected reflected an affinity for Latino values and customs. 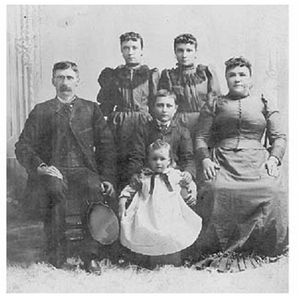 John Lorenzo Hubbell was born at his mother’s family’s estate in Pajarito. There, he grew up among parents, brothers and sisters, grandparents, aunts, uncles, and cousins who all supported each other. This “big house” environment allowed them to function as a family institution. As Hubbell developed his own empire, this “big house” attitude remained and was crucial to his success as a trader. The Hubbell Trading Post remained in the family until 1967. By the late 19th century, the Navajo trading became a family event, rather than an affair that the head males participated in alone. Also, the wealthier Navajo began to make efforts to support the poor Navajo in times of crisis. These supportive relationships strongly resembled the interdependent community that existed at the Hubbell Trading Post. Hubbell also influenced Navajo silversmithing in a way that is still present to this day. He brought Mexican silversmiths to Ganado to teach the craft of silversmithing to the Navajo men of the area so their work would be more appealing to Anglo-Americans. This increased the demand for Navajo silverwork significantly and created a moneymaking enterprise for the tribe. The store at Hubbell Trading Post National Historic Site is still in operation. Once inside the masonry post, visitors will find a sales room, a large storage room, and two office rooms that housed all of the trading post’s records from the time of its establishment. Today, these rooms house a unique collection of pioneer artifacts and Navajo art. 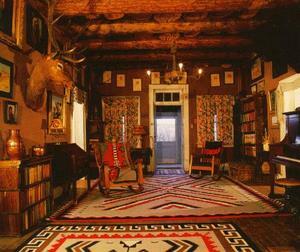 Behind the trading post stands the Hubbell family home, which also displays a collection of Navajo artwork. Hubbell’s family sold the property to the National Park Service in 1965. The trading post and Hubbell home look much today as they did during Lorenzo Hubbell’s time. At the Hubbell Trading Post National Historic Site, visitors may begin their tour at the visitor center and learn from a skilled Navajo artist how to weave an authentic Navajo rug. Visitors can also purchase food and other goods at the bullpen; buy a Navajo rug, jewelry, and baskets; attend the “Sheep is Life” workshop to learn about the Navajo lifestyle; and attend a Native American art auction. Beyond the trading post, visitors can take a guided tour of the Hubbell family home and explore the grounds of the Hubbell family homestead with its barn, bunkhouse, guest hogan, historic farm equipment, horses, chickens, and Navajo Churro sheep. They can also view a private collection of Southwestern and Native American arts and crafts. Hubbell Trading Post National Historic Site, a unit of the National Park System and a National Historic Landmark, is located one mile west of Hwy. 191 on U.S Highway 264 in Ganado, AZ. Click for the National Register of Historic Places file: text and photos. Hubbell Trading Post is open daily from 8:00am to 6:00pm during the summer and 8:00am to 5:00pm in the winter. The park is closed on Thanksgiving, Christmas, and New Year’s Day. There is an admission fee. For more information, visit the National Park Service Hubbell Trading Post National Historic Site website or call 928-755-3475. 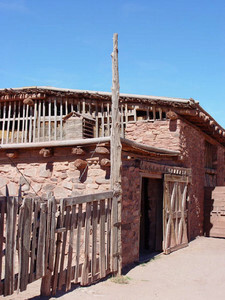 Many components of the Hubbell Trading Post National Historic Site have been documented by the National Park Service Historic American Buildings Survey including: Ganado, Storage Building, Navajo Day School, Unfinished Shed, Two-story Barn, Root Cellar, Gazebo, Guest Hogan, the House, HB-1, Bunkhouse, and Bread Oven. The National Park Service Museum Management Program exhibit, Navajo Portraits at Hubbell Trading Post, features artwork from the Hubbell Trading Post National Historic Site museum collections. Hubbell Trading Post National Historic Site is also featured in the National Park Service American Southwest Travel Itinerary and in the Places Reflecting America's Diverse Cultures: Explore their Stories in the National Park System Travel Itinerary.